Manage and nurture interactions with customers and sales prospects. Google Apps users can directly sign in with above option. users : After Google stopped support for OpenID & we are unable to offer support for Yahoo! 's OpenID. But, no worries, you can create a Google user account with your existing Yahoo! email-address and proceed to login with the new account, within a few minutes. Your data remains intact. to work over Google App Engine. 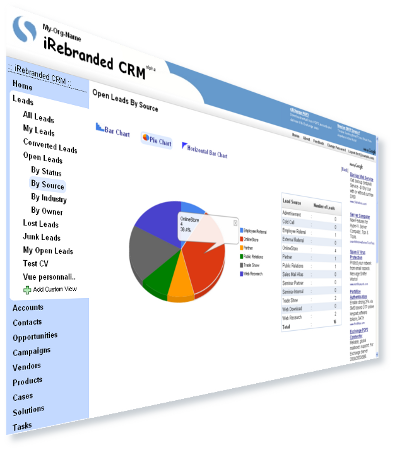 iFreeTools CRM includes all core Sales Force Automation modules enabling you to create leads, add accounts, associate contacts and track sales opportunities from new or existing customers. With iFreeTools CRM you can create and manage campaigns through different channels to up-sell, cross-sell or generate new leads and track the planned and actual costs, expected and actual response percentages and follow them up through the sales process to find the campaign effectiveness. Using Cases and Solutions modules of iFreeTools CRM, you can provide a better experience to your customers by tracking their issues, feature requests or other questions. Assign owners and priorities for such cases and enable your staff to provide a solution, either from the existing set of solutions of create a new one for use in similar cases that may come up later. iFreeTools CRM enables you to catalog all products and their inventory levels for use with the sales activities. You can also manage the vendors from whom the products are to be purchased. iFreeTools.com is built over Google App Engine; but is not affiliated to Google. The applications are currently in alpha. All write operations are audited for better security. Google Chrome and Firefox browsers.